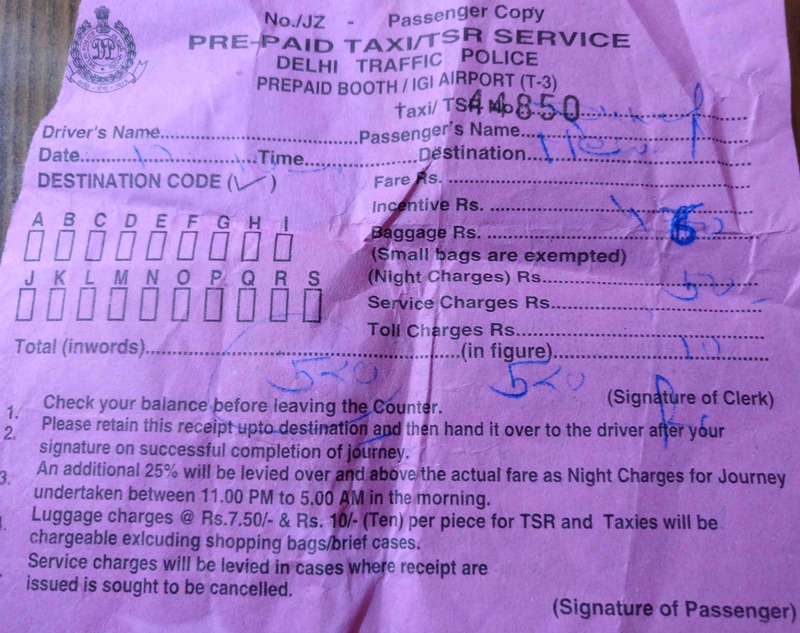 This is an attempt to bring a corruption incident to your notice, which occurred outside Indira Gandhi International Airport, Delhi at the prepaid taxi counter. My wife and I were travelling from SFO, California, US to our native place in UP. On Oct 17th, 2016 evening we got down at the airport and after coming outside I approached the prepaid taxi counter to take a cab to the hotel I was staying at. The person who was giving the receipt at the counter asked me to pay Rs. 470 as the fair, I reluctantly gave a 500 Rs note. He asked 50 more as night / additional luggage charge, as I gave him 50 more, he asked for Rs. 400 more saying that I gave him only 100 in the beginning waving a 100 rupee note, to that I replied “No ! I think I gave you Rs 500 note”, he waved the 100 Rs note again and said this is what you gave and handed that over to me. I was very tired by long journey I just had, with confusion, I took the 100 back and gave him another 500 Rs note I was carrying with me. I took the receipt for 520 and headed to my wife who was standing with the luggage. Now we headed to a cab and while loading my luggage, I described the incident to the cab driver “Jitendar”, He was furious after listening to this and asked me to report this to a police booth next to the prepaid taxi counter. I went to the police booth and told them how this prepaid taxi counter guy making fool out of people who are coming here through a long and tiring journey, there were 2 police men in that booth, they asked me to go to a traffic police, pointing outside through the window “see there is a traffic police outside, go and tell this to him”, I came outside just to find out that there was no traffic police outside. Now I came back to the prepaid taxi counter and told that person “I think I gave you Rs 500 first time and not Rs100 as you claimed”. He said it was his mistake and did not deny this time, handing a 500 Rs note to me. I took Rs 400 from him and said I will complain about this. Jitendar was with me this whole time after he scolded him badly he asked me to promise him that I would definitely complain about this to the DGP.